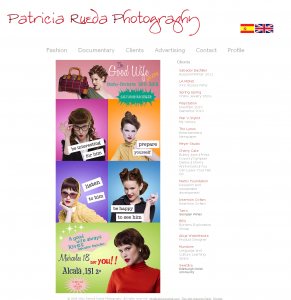 I'm continuing my quest to document some of my web design work - next up is Patricia Rueda Photography! It's always easy working with a photographer as they've already got the content to put on the website - my job was to make the site bi-lingual, easy to navigate and easy to add content to. For the content my sister-in-law Patricia can add her amazing photos directly to Flickr and then I can easily add new pages around the Flickr slideshows. The site is written in PHP to allow easy re-use of design, headers, menus and footers - it's not quite a CMS but the site has grown considerably from the first design and it's not been too hard to work with. Hopefully it shows off the photos well.